I've said before that Syrahs often taste like a color to me. Sometimes, they taste black with inky blackberry fruit and dark spices. Sometimes, they taste red, and are full of a the bright fruit of a summer berry patch. Then there are the blue syrahs, that remind me of cool walks by the ocean and huckleberries. 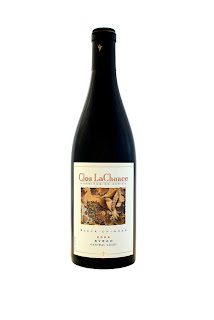 I recently had a "true blue" example of the grape: the 2006 Clos LaChance "Black-Chinned" Syrah from the Central Coast. (a new release with a suggested retail $18; available through AmericanWinery.com, and check soon with your local merchant) One of the bottlings from Clos LaChance's "Hummingbird" Series, this wine had luscious aromas of blueberry and huckleberry that evoked the forest and seaside summers. I loved the silky blueberry flavors that followed, as well as the roasted herb and toast undertow that lingered in the juicy aftertaste. This good QPR Wine was well made and nicely balanced. This Syrah went wonderfully with homemade hamburgers, pan-fried in a skillet with a zesty horseradish sauce and some bacon-onion relish. Its cooling blueberry-inflected fruit was a nice counterpoint to the horseradish, and the meatiness of the burgers brought out the roasted, toasted flavors in the aftertaste. Today marks the final edition of the Wine Book Club, the online club for wine lovers who also love to read. Our selection was Ferenc Máté's excellent A Vineyard In Tuscany--part fantasy, part House Hunters: Italy, and part viticultural adventure. I picked Máté's book for our final book because so many wine lovers dream of becoming vineyard owners and winemakers. Máté lived that dream, and is a good writer, in addition. The result is a magical tale that transports you to the hills of Tuscany, introduces you to local characters and traditions, and makes you feel that you are right there to enjoy the experience with him and his wife. 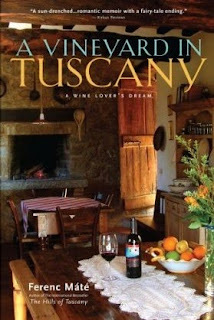 Wine Book Club stalwart Kori from the Wine Peeps describes the book as "your standard feel-good story of adversity and perseverance which ultimately results in a happy ending," but found that the "setting in the beautiful and romantic hills of Tuscany is what makes it special." Kori's been wanting to get to Italy, and this book "did nothing but reinforce my desire to make that trip." She recommends it to "anyone who loves Italian wine, is considering a trip to Italy, or who fantasizes about owning their own vineyard and winery." Frank from the blog Drink What You Like likened the book to a "fairytale"--complete with "a famous wine making neighbor, [and] living in a historic structure in one of the most beautiful regions on earth." Still, what he appreciated were the "low-key moments of the book," which served to balance out the fairy tale and make it more real. Frank recommends the book as a humorous, quick read. This month we were also joined by my friend Megan, the Wannabe Wino, who (though still in recovery from the massive amounts of reading she did in law school) agreed with Frank that the book was "a fairly quick read." She loved the home renovation and restoration aspects of the book as much as the descriptions of planting the vineyard and making the wine, but wished that there had been "a bit more info about the vineyards and how they chose to plant the grapes they did." And the book did nothing to diminish Megan's "seemingly impossible dream of someday owning my own vineyard!" And, last but certainly not least, Jim the Vinegeek joined us this month. Jim's a relatively new blogger, who has been at it since June, and I'm glad that he joined in this month. 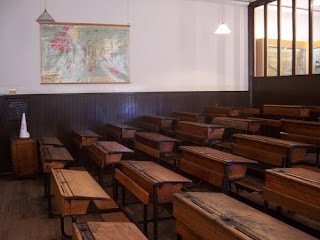 Jim was drawn to Ferenc Máté's writing, and how it evoked the "sense of community with his neighbors and the various locals who help him with his rebuild and vineyard planting, and the connectedness to the land and the seasons." He wished that Máté was a bit less self-deprecating in his self-portrayal, however, and felt that he could (and should) be justifiably proud of what he achieved. I'd like to extend a sincere thanks to everybody who supported this idea when I came up with it, and for Kori and Frank who were such dependable reading companions. I'm glad to have been part of the Book Club and rest assured there will still be lots of book reviews here on GWU$20. According to the index of topics in the left sidebar, I've never reviewed a wine with Bourboulenc grapes in it. I'm sure I've tasted it before, but not since I started this blog. Perhaps that's not too surprising. As best as I can make out, there are only about 2000 acres of the grape in cultivation. And the wine is mostly used in white blends, where it can be paired with Rhône varieties such as Roussanne and Marsanne. Bourboulenc has a lot of acidity, and can lighten and brighten white wines. Recently I had a wine that included Bourboulenc grapes: the 2007 Château La Canorgue Côtes du Luberon Blanc from the southeastern Rhône ($18.00, domaine547). The wine had a lot of character and was made from a combination of Bourboulenc, Clairette, Marsanne, and Roussanne. It was round and full, but light and fresh at the same time--a fascinating set of contradictions. Aromas of pears, citrus, and flowers welcome you into the tastes, which are along a similar spectrum of white orchard fruits (apple, pear), citrus (lemon and a bit of bitter orange as the wine warms), and even some floral and mineral notes.This wine is organic and biodynamic as well, and delivers excellent QPR with its complexity and price point. If you like white Châteauneuf-du-Papes, but don't like paying the steep prices they often command in the market, this is the wine for you. As an added bonus, this is one of the few wines that I've had that didn't clash with artichokes. We had it with the vegetarian-friendly Pasta with Almond-Herb Pesto and Artichokes. The round yet fresh flavor profile went nicely with the zesty herbs, ricotta cheese, tomatoes, and even the artichokes that went into this dish. It's peach season--or at least that's the evidence from my local farmer's market. Nothing quite says late summer to me like some really ripe peaches, perhaps some vanilla ice cream, perhaps some meringues or madeleines, and a cool glass of dessert wine. In the event this dessert suits you, too, and you don't have a stash of Sauternes begging to be opened,try to get your hands on some of the 2006 Bonny Doon Vineyard Le Vol des Anges Beeswax Vineyard ($25.50/375ml, club shipment from winery a few years back; still available in the market for $29-$33/750ml--but I'm dubious they're full bottles so check before you order). I was very, very impressed with this wine, which was made from Roussanne grapes that had been blessed with "noble rot" or botrytis. While I often find US dessert wines much too sweet, and lacking in the acidity that brings balance to a wine, this bottling had a excellent balance. It also had a definite Sauternes-like aroma and flavor profile. The wine was a luscious deep gold in color with a satiny, slightly viscous texture. The aromas and flavors were very similar, with honey, quince, and candied lemon notes predominating. In spite of all that sweetness, there was a solid core of acidity that kept the wine from being too cloying. Kudos to Bonny Doon for this well-made wine that was worth every penny it cost. Though you may find dessert wines that are a tad cheaper, I have yet to have a domestic dessert wine this good for this price. Very good QPR. So get yourself some peaches of other summer fruit, and treat yourself to an elegant dessert in the not too distant future. And if dessert wines are something you only drink at the holidays, nab some of this now while it's still available. This Week on Serious Grape: "Grape School"
My idea? Grape School. While your kids and neighbors kids are learning reading, writing, and arithmetic, why not learn about some new grapes? Why should kids have all the fun? I've put together a list of twelve grape varieties that you may not be familiar with to take to your favorite wine store. Have them put together a mixed case so that you can have an interesting wine experience whenever the mood takes you this fall. Regular GWU$20 readers might want to look at the "extra credit" grape pick--it's one of my favorites, and it might become one of yours, as well. So head over to Serious Eats and check it out. And as ever, if you have particular wines to recommend, please do so in the comments. 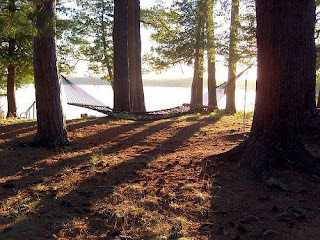 It's been a while since I've posted a Friday Nights IN suggestion, but if your life is like mine the days seem too short to get everything done, the kitchen is too hot to cook, and the idea of yet another something cooked on the grill is not that appealing. So my suggestion is to take a culinary trip to the Adriatic and Mediterranean with a meze platter and a wine from Italy's Veneto region. First up, the food. Meze is not so much cooked as it is assembled--so it's perfect for single diners, couples, families, or starving masses. Anything goes really, but to get you started you can look at the suggestions in this recent Bon Appetit recipe. I know the hummus doesn't have Tahini in it, but after several goes at it we now prefer this flavorful, easy version. And the cucumber and feta salad is delicious. If you've got people coming for dinner who don't like to eat shrimp, buy a roasted chicken and have at that instead (or in addition). Add and subtract at will until you have just the right mix of flavors and textures to suit your palate. Then, the all important issue of wine. With this meal you want a wine that is crisp but still has some body to it. It needs to be able to stand up to feta, not overwhelm the shrimp, pair nicely with the vegetables--you get the picture. 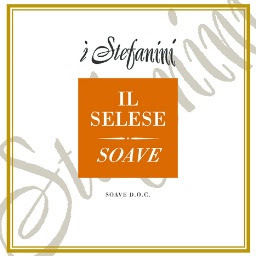 In short, you want a good Soave, like the 2008 I Stefanini Il Selese Soave (MSRP $12.00; for more information contact the importer, Domenico Selections). This wine smells of summer, with lovely musk-melon aromas accompanied by some white floral and saline notes. This next observation will probably only resonate with those of you reading this from the UK, but the aromas reminded me particularly of elderflower cordial. Flavors of white peach, lemon, and bitter almond provide a nice point-counterpoint with the saline notes and the flowers and the wine has a juicy, lip-smacking aftertaste. This wine is terrific for the price and very distinctive. You'll be surprised Soave can be this good, and deliver such excellent QPR. Is Your Wine Buying Out of Whack? Not surprisingly (given the chicken) I have a fair amount of Pinot Noir, Syrah, and red Rhone blends in the house--all of which I think taste great with bird. But I've been organizing my wine, and I'm struck by how much Cabernet and Bordeaux blends I have. And when I get emails, I am always tempted to buy more. It's like a sickness. And I wonder why, because some of my favorite whites (Riesling, Chenin Blanc) age well. Do your wine buying habits reflect your drinking habits? It's easy for your wine buying to get out of whack. The offers come to your mail box, you see a wine on the shelves and sometimes you don't stop to think "do I need this wine, or do I already have 27 bottles just like it--with no plans to drink them anytime soon?" When was the last time you took stock of what you enjoy drinking, what you buy, and what you have on hand in your cellar? And do you have any tips to share on keeping your wine buying in line with your wine drinking? Some joke that most Americans age their wine on the back seat of the car on the way home from the store. Talk about cellaring wine and people start to look anxious. They imagine that they'll no longer be interested in drinking a wine 5-7 years after they buy it. And if they don't have a wine fridge or a cellar, they wonder where they'd keep a bottle of wine for that long. But what about short-term aging? I'm starting to become a real fan of storing most red wines for 1-3 years. This falls far short of what most people mean when they talk about "cellaring" wine, but it has advantages. It tends to soften a wine's edges; it tends to bring out nuances in the wine beyond just its fruit; and it gives the wine a lushness that isn't always there when it's young. Here's my latest experience with short-term aging. 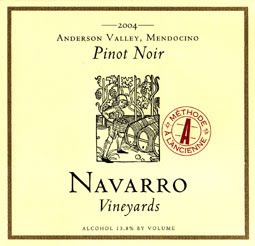 Two years ago, on a nice August day in 2007, I visited the Navarro Winery tasting room and sipped some 2004 Navarro "Méthode à l'Ancienne" Pinot Noir from the Anderson Valley. Here's what my tasting note said: "Nuts, earth, and mushroomy/truffley notes accent this Pinot with its core of bright acidity and its cherry fruit. I think it will age very, very nicely." So I bought a bottle for just under $25 and tucked it away. This is what I tasted almost two years to the day later: "This has been in the cellar for 2 years, and is drinking even better now. Bright fruit is still present (cherry, blackberry), with integrated earthy and mushroomy flavors, a nice lashing of minerality, and the acidity has moderated somewhat resulting in a rich, flavorful, yet bright drinking experience. Everything new world Pinot Noir is supposed to be, for around $25. Exceptional QPR." If you want to try your own "short-term aging" experiment, Navarro is currently selling the 2006 vintage in their "Favorite Six" Sampler--six wines for $127.00 + shipping. You do the math, but I think that works out to around $21 a bottle, and there are other treats in there, like Navarro's Riesling and Gewürztraminer that you can drink while you wait for your Pinot Noir. Or you can just get the 2006 Pinot Noir for $29/bottle. I can't promise your results will be exactly the same as mine, but next time you buy a wine you like, get yourself another bottle and put it aside for a few years. Then you can see for yourself whether you prefer your wine aged on the back seat--or left for a few years beyond. I like to think I'm not a wine snob, but I have to admit that I do look askance at 1.5ml bottles and 3li boxes of wine. And I don't buy much wine in that kind of large format size, either. I assume that its mass-produced, and not in a good way, with chemical aromas and uninspiring flavors. So when the folks from Fish Eye poured their Pinot Grigio at the Wine Bloggers Conference a few weeks back I gave it the fish eye. I wasn't alone (names withheld to protect the guilty). But we all dutifully took a sip of the wine. Then it was true confessions time. "This is really good," I muttered, sending out a quick tasting note on my phone. "Wow. I didn't expect much from this but its really a nice Pinot Grigio," someone else agreed. Everyone at the table was similarly keen on the wine--and similarly sheepish about their initial skepticism. We were even more impressed when we discovered that the price for 750ml was around $7, and the price for the 1.5li was around $12. And they may be even less in your market. This is not profound Pinot Grigio, but it is superbly drinkable Pinot Grigio with fresh lemon and apple aromas and flavors--and none of that horrible, acidic bitterness that made me swear off the stuff a few years back when it became everyone's favorite wine-by-the-glass selection. Excellent QPR for a quaffable wine that has the proper varietal characteristics and an appealing price sticker. Get yourself a mess of shrimp and some cocktail sauce, toss a salad, buy the big bottle or box of Fish Eye Pinot Grigio and invite your neighbors over for dinner. It will be a perfect end-of-summer meal. When rosés are good they're very, very good--but when they're bad they're horrible. Thankfully, I've had many good rosés this summer. And the one that I keep buying more of is the excellent QPR 2008 A to Z Wineworks Rosé ($12.49 from my local grocery store; $10 direct from the winery). This was one of those serendipitous discoveries. I wasn't looking for a rosé or any wine at all, to be honest. But there it was, sitting on the shelf in the supermarket. What caught my eye at first was its deep rose color. Not magenta, not deep salmon--true rose. Oddly enough, this color is rare among rosés. So I took a bottle home and I've been hooked ever since. The 2008 A to Z Wineworks Rosé is a lovely, full-bodied but dry rosé made from Sangiovese grapes. It has an intriguing mixture of fruit, herb, and vegetable flavors and aromas. Imagine a wine that combined raspberry, strawberry, parsley, and cucumber notes. Now imagine how refreshing and crisp that combination would be. That's exactly what this wine represented to me, and with the temperatures still high and the sun out it's a combination that seems to fit the way we're living now. I wasn't familiar with A to Z Wineworks so I got on the 'net and did some surfing. 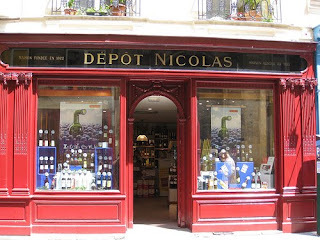 They have a great website, and their motto is "Aristocratic wines at democratic prices." Standing behind the name is a dynamite team of Oregon's best winemakers, including Bill Hatcher (formerly of Domaine Drouhin), Sam Tannahill (formerly of Archery Summit), and Cheryl Francis (formerly of Chehalem). They make a full lineup of wines, including Pinot Noir, and not one of them retails for more than $20. So check them out and get a mixed case of Riesling, Pinot Blanc, and other goodies to get you through the fall. And don't forget this great rosé. It's terrific now, and will be just as good with turkey sandwiches in November. The heat is on and in an attempt to cool down, many of us are reaching for white wines that can take a bit of a chill and remain flavorful. It helps cool you down if the white wine in question has a zingy, refreshing array of aromas and flavors. Finding this kind of wine and sipping it after a long day can feel like imbibing a cool breeze. If you're looking for such a wine, look no further than the 2008 Dry Creek Vineyard Sauvignon Blanc (available for $14-$19). This is a new take on an old favorite, since Dry Creek Vineyards have been making Sauvignon Blanc from Dry Creek Valley fruit since the early 1970s under the name "Fumé Blanc" in a nod to the Loire's white wines. Beginning with 2008, however, they are labeling the wine "Sauvignon Blanc." The wine is a domestic Sauvignon Blanc that can hold its head up among zingy New Zealand bottlings, but has a bit more softness and is far less assertive. The juice never sees oak, and the softness in the wine comes from a small amount of Sauvignon Musqué that is added to the final blend. The wine has beautiful, luscious aromas of grass, hay, melon, and citrus. You will find the same notes in the flavors, with the melon and citrus taking a front seat which makes the wine very refreshing. The aftertaste takes those hay and grass notes and turns them herbal, and the freshness lingers nicely in your mouth. I think if you tasted this blind, you might at first mistake it for a New Zealand Sauvignon Blanc--especially in its aromas. As the wine opens and the flavors develop, though, you get more melon and floral notes that add to the complexity. Excellent QPR. This wine would be perfect with seafood, chicken, or salads--in short, the kinds of food we are all eating now as the Farmers Markets fill with produce and the prospect of turning on the stove seems very unappealing. Kudos to the folks at Dry Creek Vineyards for breathing new life into an old favorite, and for showcasing all that the Dry Creek Valley has to offer in terms of quality and value. Dreaming About a Vineyard in Tuscany? 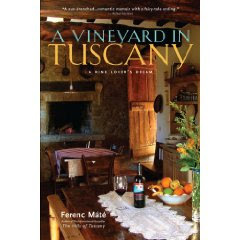 This August, the Wine Book Club will be reading Ferenc Máté's A Vineyard in Tuscany: A Wine Lover's Dream. ($13.95; 11.16, Amazon.com). The author, like many of us, dreamed of one day throwing caution to the wind and making wine. His adventures in Tuscany's chi-chi Brunello di Montalcino region, in a 13th-century Italian building that used to house monks, is a great read, and a perfect escape for the end of summer. It's also a perfect occasion to end the dream that was the Wine Book Club. It hasn't turned out quite as I hoped and though Kori from Wine Peeps and Frank from Drink What You Like have been stalwart supporters of this effort, we feel like there's not much interest among other wine bloggers--and you know what it's like to go to a book club meeting when you're one of three people in the room. It's OK, but part of what should make this fun is comparing what you think with many other people. That said, I'm sure the three of us will keep reading wine books and reviewing them on our individual sites, but they won't be on a regular schedule and we won't be reading the same titles. If you want to help sing the WBC's swan song, please join us in this journey through Tuscan wine making and living the wine life. As usual, please send any links to posts to the email in the left sidebar or leave the link in the comments section of this post by 5 pm on Wednesday, August 26. I'll post the final roundup on Thursday, August 27. This is a terrific Sicilian red wine made from a blend of equal amounts of Nero d'Avola, Nerello Mascalese, Frappato Nero, and Nerello Cappucio. Luscious aromas and flavors of cherry, blackberry, and licorice are accompanied by a smoky tobacco note. And the licorice is what made the wine stand out for me, and consider it to be excellent QPR. The wine is still a bit tight and young, so give it some time to open up with help of some air (via vigorous swirling or decanting) or buy a case of it and drink it over the next two years. Dievole's Fourplay is an excellent pizza and pasta wine, with enough cherry fruit to make it good as a stand-alone sipper, too. But I'd advise pulling it out to go with your mushroom pizza, some spaghetti with meatballs, or any other traditional Italian fare that involves a tomato.